Everyone is required to sign a release before participating on a trip or spending any time at Mother Lode River Center. Minors must have the form completed by a parent or guardian. After completing the booking process you will be prompted to complete a waiver online. What happens when the water is high? 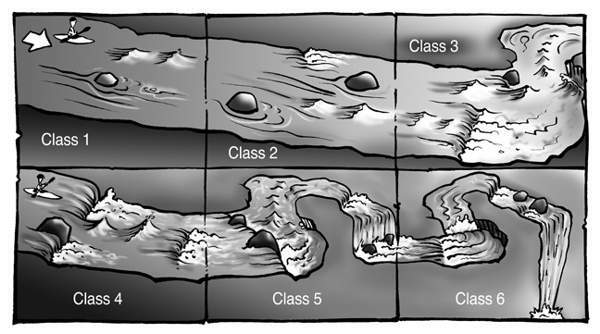 We are always taking water levels and conditions into consideration when running our trips. Springtime for example typically has higher water levels than late summer. We do our very best to provide you with the trip you booked but occasionally trips must be adjusted due to river levels and weather conditions. The beauty of our area is that there are endless possible river trips, so no matter the conditions we have options. Nevertheless, extra caution is required at higher water. An excellent rule of thumb is to you choose the appropriate difficulty of trip to suit your least capable participant.Age limitations, physical qualifications, and clothing requirements must all be adjusted appropriately for water conditions. If you have more questions please reach out to us. Are there physical requirements and must I be a swimmer? Vigorous paddling is required so all participants should be fit, active and healthy. Swimming ability is highly advisable on Class III and required on Class IV. It is also mandatory at high water on all classes of river. What is the River Usage Fee? This varies on a variety of factors from time of year, water levels, participant abilities, etc. Typically though Class IV trips employ smaller boats that carry a maximum of 6 and Class II-III trips employ larger boats with a maximum of 8 paddlers. Will people from other groups be in my boat? Often the answer is yes and you will almost always enjoy making new friends. However, you can book an entire boat provided advance “charter boat” arrangements are made. Contact the office for details. What is the bathroom situation out on the river? There are toilets at put-in and take-out. There are also composting toilets on the river, usually at the lunch site locations. However, it is always best to use the facilities before you leave the put-in. Let your guide know if there are special issues so we can plan ahead. Spring can be cool and occasionally cold, while the summer will see temperatures that sometimes range around 100 degrees. This makes the water, which is always brisk, more inviting. wetsuit and paddling jacket are recommended. In spring or during cooler weather, a wetsuit and paddling jacket are recommended; both of these can be rented from Mother Lode. We always recommend against cotton clothing as it pulls warmth away from the body, instead try synthetic materials like fleece or wool. Once summer arrives, a bathing suit covered by shorts to prevent chaffing works well. Combine this with a loose shirt, sunscreen and a hat to minimize sunburn. Closed toes shoes are always required regardless of season. Wetsuit/paddling jacket combo can be rented for $15. These should be reserved before your trip. Can I use my personal lifejacket/PFD? Unfortunately our insurance carrier does not permit the use of customer owned PFDs. A Coast Guard approved Class III PFD will be provided on your trip. Can I bring a camera or cellphone? We always advise participants not to bring anything you are not prepared to lose or have damaged on the raft. We cannot secure your GroPro or provide a dry space for your cellphone so we recommend you leave them behind. Commercial photo companies do provide action shots at several major rapids, which can be purchased after your trip. Bringing a water bottle is a great idea. We provide water coolers to refill your bottle should you run out along the way. Please make sure to remind your guide to secure your bottle to the raft. other bulky items cannot be accommodated in the boats. We do our best to accommodate allergies and other issues provided we know about them in advance. If you have serious or life-threatening issues, however, we recommend you provide your own food to be absolutely sure to avoid a problem. While river trips are super fun, they are not a party. Safety is our first priority. If you are impaired by alcohol or other drugs, you can expect to be excluded from the trip for your own safety and the safety of others. How do I get to Mother Lode River Center? Check out our maps and directions page for all of the information. Please keep in mind that depending on your cell provider service can be spotty in the valley. We have written directions on this page as well. Absolutely! Mother Lode specializes in providing a broad range of options including dome tents, canvas cabin tents, yurts, a cozy river cabin and an ECO Retreat house on site. Visit Accommodations for details. We love animals. Unfortunately, they cannot be accommodated at the camp. If you need dog-sitting services please inquire with our office. Penny and our office staff are super friendly, knowledgeable and glad to help out. Contact us today!